After an extremely lucky afternoon playing slot machines, one Slotland player is glad he trusted his gut feeling and not only continued to play but increased his bets. The player, known at the all slots and video poker site as SHLOMIC, was up $1900 after a $100 deposit because he trusted his gut feeling and increased his wagers at just the right time. The day of SHLOMIC’s winning streak didn’t start out so lucky. It was a boring day at work and nothing had been going well that morning so he’d locked himself in his office, logged on to Slotland.com, and started playing his favourite online slot machine, Treasure Box. He started with small bets and only increased his bets to the maximum after a streak of small wins. Treasure Box is a three-reel skill-based slot machine where players can increase their chances of winning by holding reels for the next spin just like video poker players hold their best cards. Treasure Box hasn’t just been lucky for SHLOMIC. Since last March there have been six six-figure jackpot wins at Slotland.com and two were won playing Treasure Box. Most recently, a Canadian player won $195,083 (€126,910) on the ever popular game which, at the time, was the biggest progressive jackpot ever won at Slotland. Within days, SHLOMIC’s winnings were in his bank account ready for some serious shopping. He also received $1000 for sharing his story in the site’s member newsletter. 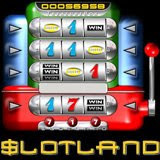 Slotland.com currently features thirteen unique slot machines and three video poker games. Four of the most popular online slot machines and two video poker games are also available on mobile phones and PDAs. All of Slotland’s games give players the option of placing a maximum bet for a chance at the progressive jackpot which was recently hit for $169K and is currently over $57,000.